It’s that time of the year again, Microsoft Management Summit 2010 is coming up. Conferences like these are always a great opportunity for vendors to demonstrate new products and technologies. I thought it would be interesting to go back to MMS 2009 and take a look at some of the futures Microsoft was selling in the virtualization space. One of the big demos on stage during the day 1 keynote session was the seamless integration of public and private clouds — possible only with Microsoft System Center Virtual Machine Manager technology, according to the script. Now, there is nothing wrong with a vendor demonstrating visionary technology in a setting like this. But if you actively call out your competitors as being incapable of offering a particular solution, a higher level of scrutiny is certainly warranted. The host with the cloud icons are part of the public cloud hosted by Maximum ASP, while the host with the regular cloud server icon are part of my private cloud. Wow, public and private cloud — two great tastes that taste great together. And the significance? Vendors like VMware want you to believe that you have to revolutionize both the data center and the cloud in order to take advantage of scenarios like this. They want you to rearchitect your entire infrastructure. Our existing System Center customers have the foundation today by which to seamlessly move from the private cloud to the public cloud. 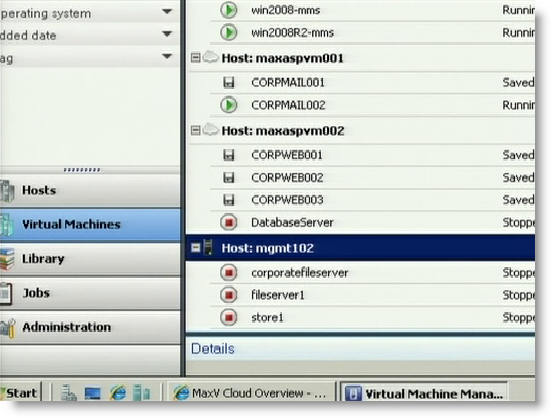 This preview of a future release of System Center Virtual Machine Manager shows you the potential of the integration of the private cloud with the public cloud. You can get started today by taking advantage of Maximum ASP’s public cloud hosting capabilities. Okay, I get it. Someday SCVMM will be able to talk to a Hyper-V machine at some web host and you won’t have to rearchitect anything — and you can get a taste of it today somehow by signing up with MaximumASP. The public-private cloud is not a product we are offering at this time. During the demo it was simply a POC that was constructed with Microsoft. Well, we all knew it was a POC. But why would Microsoft make such a powerful point that VMware cannot offer this capability? Is this FUD? A year ago, Microsoft attacked the virtualization industry leader for not offering a feature equivalent to a fake concocted demo they highlighted during their keynote. Surprisingly, a year later, Microsoft and their hosting partner are still not offering the convoluted capability. Frankly, this is not cloud computing — public or private. This stunt merely highlighted the fact that you can place a hypervisor host at a remote location and manage it from the same console that you use to manage the other hosts in your datacenter. Oh, and as for the web server VM they migrated from the “private” to “public” cloud — no details on just how the clients of that service would find it in the new location… but that’s another topic. What does POC stand for ‘Piece of Cr*p’? Heh heh. Well, traditionally it has meant proof of concept, but you may have cracked the code on this one.